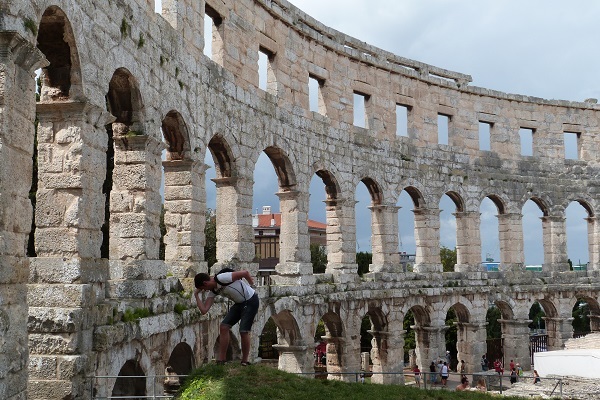 Welcome to Pula, it’s a big ‘Plus’ to come here! ‘So what’s there to do in Pula on the Istrian Coast of Croatia?’ I mused as I tucked into my breakfast of croissants and a strong black coffee enough to make the spoon stand up. I watched the Roman Forum of the city, the place where everyone meets, slowly spring to life in the early morning sun. Several stalls were being set up, a couple of kids played tag around the square and an overeager waiter hovered inches away from me. He refilled my coffee. I needed it. Last night, I didn’t sleep very well. The French group of lads insisted on playing a drunken game of catch in the hostel dorm and ended with a staggering Frenchman sleeping on the floor, unable to cope (loudly, may I add) with the ladder rungs to his top bunk. Not only that, one of them had lost the air conditioning remote in the room somewhere so temperatures were pretty high enough to make a high-definition sweat print of my body on my bed. However, after that much-needed coffee, I was cheered up. Why? All I had to do was look around where I was. 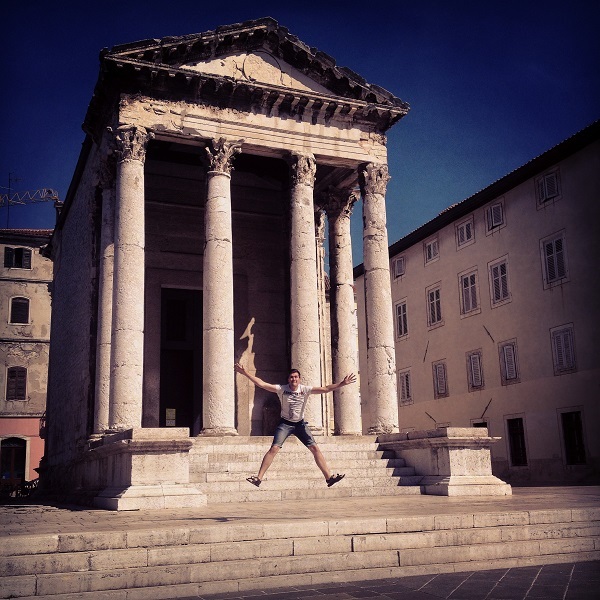 I’m here, in Pula! 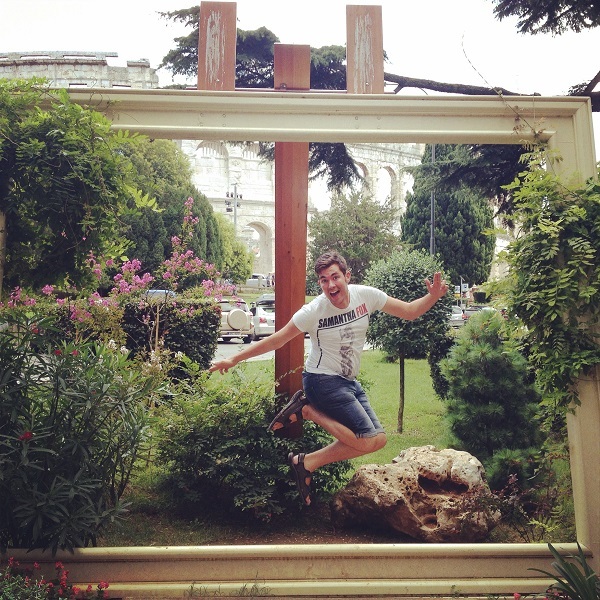 The thought of being in Croatia hadn’t sunk in yet and I could go on grinning from ear to ear. On the plus side, those pesky Frenchmen checked out that morning. 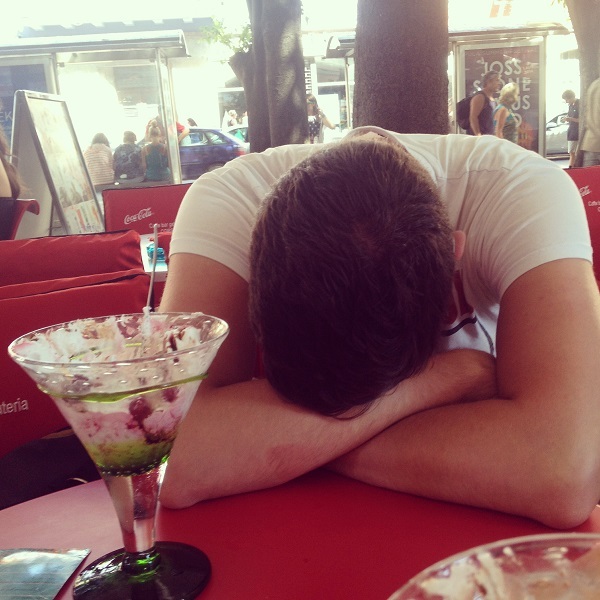 Draining my second cup of coffee, it was time to wake Mark from his sleepy slumber and get sightseeing. After dragging Mark out, I came back to the Forum. It really does feel like it’s the place to be and to be seen. After all, one of Pulas’s attractions in the Forum is the Temple of Augustus. From ancient times to the Middle Ages, it was used as the city’s main meeting point for everyone, there to worship the gods and barter goods with each other. Since then, it was used as a church then a grain store. Today, it contains a museum for eager tourists. The Temple of Augustus really showcases its Roman origins, seeing as Pula on the Istrian Coast was in close proximity to Italy across the Adriatic Sea. Visitors can go in to check it out but for me (and Mark’s dismay), it was another chance for a jumping photo! 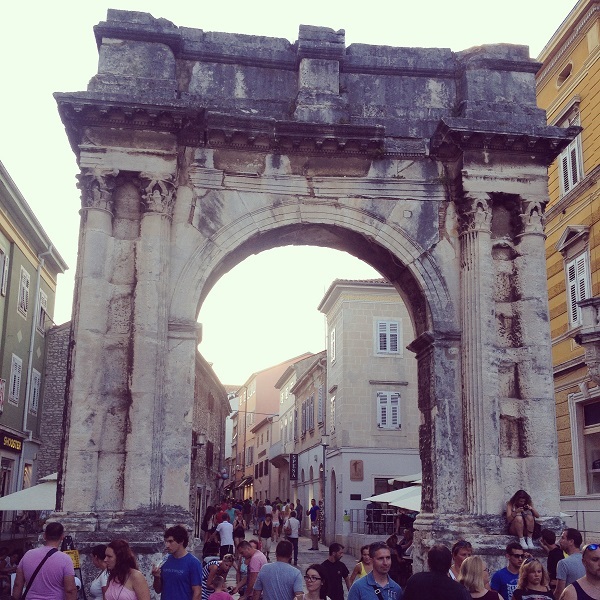 Aside from the Temple of Augustus, Pula’s main tourism office is based here alongside with many restaurants and souvenir shops. Standing high and mighty on the hill in the middle of Pula is the Arena, also known as the Ampitheatre. You can’t miss it. I was pretty excited to see this historical and 1st Century structure up close. The Arena hosted many gladiator fights to a 20,000 seated crowd and you could just imagine the baying of blood reverberating around the stoic pillars. However, I had to do this first as we were queuing in to pay 70 Kuna entrance fee. Me: It was built first using boats, canoes and kayaks and the like. Enough to say, he walked off after that. His disgusted face after that joke! Exploring the ancient limestones of the Arena, you can go full circuit. You can even do it dressed in full gladitorial costume but unfortunately Mark intervened before I had the chance by dragging me away for some photo opportunities. Remember to wear sure-footed footwear, you are expected to clamber over ruins. Perhaps gladiators did the jumping strongman pose in their time? ‘Oh, he does look like he needs looking after,’ she commented whilst going past me with a pitiful look on her face. Needless to say, she made Mark’s day as he rolled around on the steps clasping his sides with laughter. I gave her the thumbs down at her fleeting back. The Chambers underneath the Arena gives a fascinating perspective of life in Roman Times. Urns and pots unearthed are on display but not to worry, there are information displays on hand. If you’re lucky to be here during Pula’s Film Festival, the chambers hosts them. 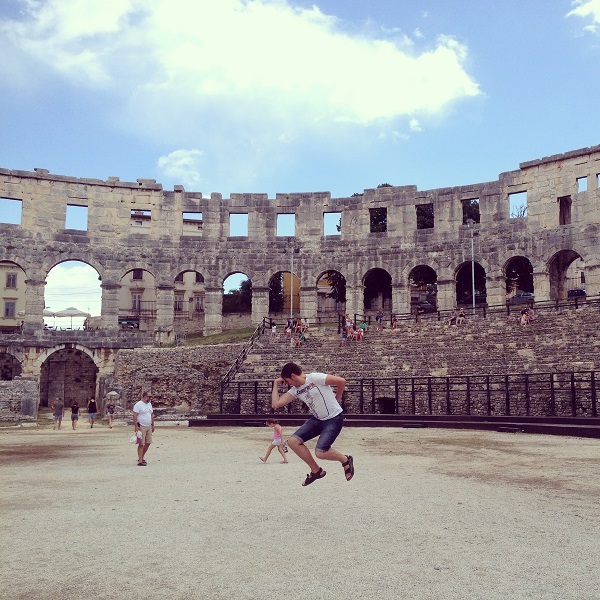 During the summer evenings, you can even watch mock gladiatorial fights. 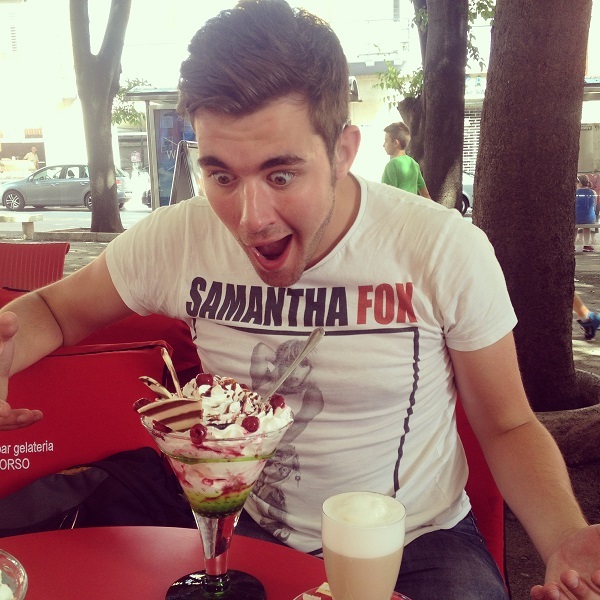 But Mark and I decided that Ice Cream aka Gelato was far too important. Working up a hunger after the first round of sightseeing, we decided to be extremely healthy and go for Gelatos. Ordering the Raspberry Supreme, my jaw dropped open at the gigantic size of my offering. I was to eat all this?! I mean, could I actually do it. Stuff an entire gelato in my belly? I had an hour to kill, that’ll be okay, right? Maybe I shouldn’t have drunk the iced coffee first. I stared horrifyingly as Mark collapsed in his chair and waved a napkin at me to indicate he was about to burst. He only had a half of his. Sampling my first spoonful, it was absolutely delicious. It was like there was a party in my mouth! Even Samantha Fox, my t-shirt of the day would have approved sultrily. With a crazy fervor that gripped me, ‘I would eat all of this,’ I proclaimed to myself! We had been in Croatia long enough to warrant a leisurely stroll down the main shopping street that is Carrarina. This street marks the eastern boundary of the Old Roman Walls and you can’t miss it. I was pretty in awe of the polished marble like floor of the pedestrian street and the gilded ornamental shopfronts. You do feel like you’re transported back in time. Selling high street fashion, souvenirs and local food produces, this street is a buzz with locals and tourists alike. At the end away from the Roman Forum, you will reach the Triumphal Arch of Sergius. This commemorates the Sergius family who achieved distinction in 1st Century BC. It’s a pretty nifty thing to look at and contrasts remarkably with more modern buildings surrounding it. 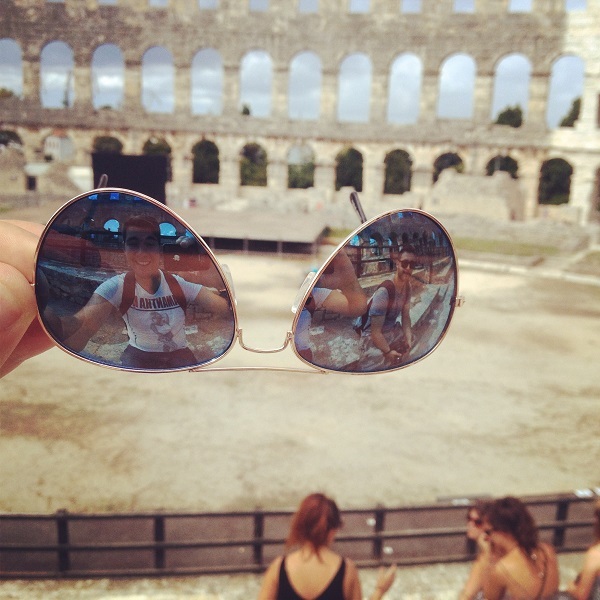 What Else is there to do in Pula? Well, actually there’s a lot! Zerostrasse – In the heart of Pula, there are an Underground network of tunnels used during the World Wars for shelter and to store ammunition. Roman Mosaic Floor – dating from the 3rd Century, you can see a very well-preserved mosaic depicting a gruesome punishment for Dirce for murdering her cousin. However, expect rubbish scattered around. Pizza Restaurants – As Pula is heavily influenced by Italy, it comes to no surprise that the majority of the cuisine in the city is Pizza. I do recommend to find a backstreet restaurant as you will get better value (and taste) for your money. 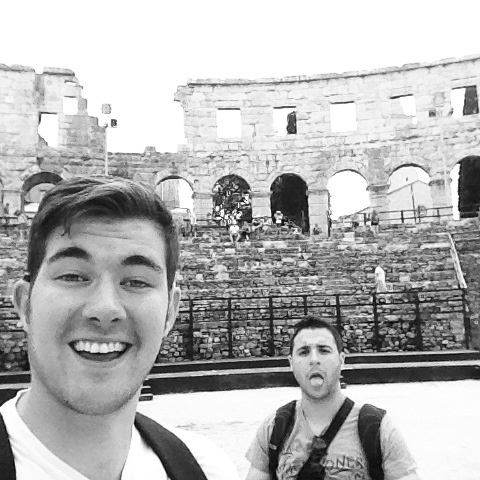 After discovering this photo-opportunistic gem along the harbour, we simply ate at one of Pula’s Pizza restaurants. However, we were in a conundrum. Remember, when I was in Zagreb refusing to go to Pula because of the distance it would take a bus to get from Pula to Zadar, our next destination? And that I was swayed to go because there would be a Jadrolinija ferry between the two destinations cutting short our time spent travelling? We were wrong much to our dismay. The ferry was cancelled for the year and it seemed we had no choice but to catch the bus that would take an epic eight hours. Wow, I haven’t seen a Samantha Fox t-shirt in a heck of long time. I wonder what she is doing now? You are just increasing my desire to finally get to Croatia. There seems to be a lot more of the historic sites than I thought and in great condition too. You’ve also reminded me as to why I don’t miss hostel dorms anymore. That would drive me crazy. I have you know it was an amazing gag! I suddenly thought of it on the spot. Seriously, you haven’t been to Croatia?! You need to gooooooo!